We certainly are not crazy about this style of feeder but there is a market for these type of feeders and we don’t want to leave it to the Chinese importers or their re sellers. Perhaps for those that are raising meat birds where the loss of a bird isn’t going to be a big deal. Or for those on a limited budget that need a solution to their rat problem and can’t afford the difference in cost of a better rat proof treadle feeder. We fixed the deficiencies found in the cheap Chinese treadle feeders as best as we could and still keep the price down. Instead of using easily chewed through aluminum we used 24 gauge galvanized steel. We added a feed lip on the front edge. Instead of the three piece treadle arms and front step we used a one piece wrap around treadle. The flimsy and slippery metal front step was replaced with a wooden perch bar as the sheet metal steps on the cheap Chinese treadle feeders will bend over time, jamming the mechanism or losing much of the vertical lift of the feeder door as the bent step bottoms out on the ground or litter. The cheap Chinese treadle feeders all use small machine screws to attach the treadle arms to the sheet metal step, to serve as linkage points on the treadle arm/link joint, and the lid/link joint. Several problems with doing that although it does save a lot of money on bolts and fasteners. First the cheap Chinese treadle feeders are known for losing screws and nuts on a constant basis. Second, the screws are so tiny that it is a matter of time before they snap through metal fatigue. In engineering terms even a bolt is considered a beam when it comes to computing stresses and load carrying abilities. When you go from a 1/8″ machine screw to a 1/4″ bolt you don’t double the strength and stiffness, you quadruple the strength and stiffness. As the machine screws also served as pivot points the surface area of a 1/8″ machine screw is only .39 sq inch but a 1/4″ bolt has .79 sq inch so the weight is spread out over twice the area. On larger surfaces increasing surface area has no impact on total friction but here the surface becomes so small that one of the sliding surfaces begins to dig in instead of sliding. The point being that a 1/8th diameter axle is going to bend easier and as the surface area is half the size that small of an axle will also wear out the surrounding metal faster, creating slop in the mechanism until the machine screw snaps. A 1/4″ bolt will never snap in this situation. This style of feeder is certainly second best and a compromise on both safety and quality. The mechanism is complicated, six pivot points instead of two pivots points on our standard rat proof treadle feeder. Three times the pivot points mean three times the wear and tear. More to go wrong too as the door could jam while up or while down. There are more pinch points, places where bird might get caught. Then there is the overhead door action which requires a totally different training approach that will take weeks instead of hours. These cheap Chinese treadle feeders are basically the front half of a Grandpa treadle feeder so the door swings up into the bird’s face and up over the bird’s head, making most birds reluctant to begin using the feeder. On the positive side the cheap Chinese treadle feeders have two fewer pivot points that the Grandpa treadle feeder, two fewer nuts to fall off. 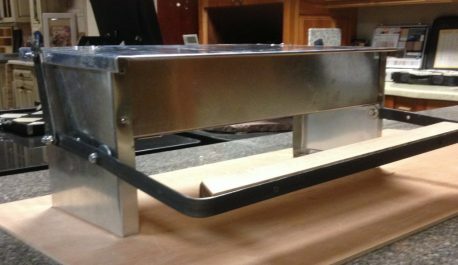 Our MA 2017 feeder also uses 1/8″ thick x 3/4″ thick steel bar stock for the linkages and treadle arms, far stiffer, far sturdier, than the aluminum sheet metal stampings used by the cheap Chinese treadle feeders and better than the even thinner sheet metal linkages on the Grandpa treadle feeder. The back of this style of treadle feeder has a 1/4″ to 3/8″ gap required for the lid to open and close so as the cheap Chinese treadle feeder reviews on Amazon will say they are not completely mouse or rat proof but they will stop wild birds. Since our MA 2017 model has a half inch feeder lip projecting inside the feeder to help with feed raking birds it doesn’t need the wire grid like the Grandpa treadle feeder requires so you won’t have the feed flow problems that the Grandpa treadle feeder is reported to have according to some reviews. And of course the feed doesn’t need to flow down a hopper anyway. The dangerous side guards are missing on both the cheap Chinese treadle feeders and our MA 2017 treadle chicken feeder. 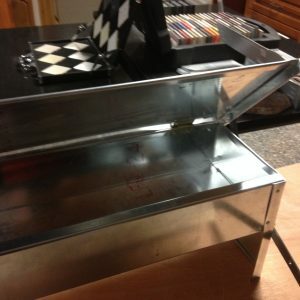 The Grandpa treadle feeder side guards are an attempt to prevent birds from getting caught under the downward swinging door if a bird is trying to eat from the side but adding the side guards adds two dangerous pinch points to the feeder. We believe that it is better for a bird to get clocked on the noggin than trapped between the side guard and lid. The chicken might survive the hit, it won’t survive being trapped and strangled. 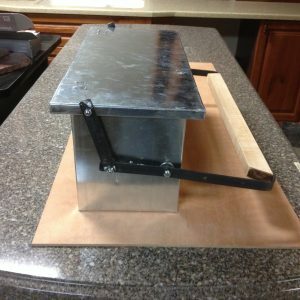 Of course this feeder will require blocking the feeder door open or the use of training bolts to prevent the feeder door from closing, around two to three weeks according to the Grandpa treadle feeder training instructions on their website. That is three weeks of continued feed loss, three weeks of dirty feed if you have rats or mice. However the reported feed clogging that the Grandpa treadle feeder is prone too won’t happen on this style of treadle feeder as there is no feed hopper other than the trough the feed sits in. One of the issues with the cheap Chinese treadle feeders were the slick sheet metal steps, the reviews state that the bird’s feet would slip. Our narrow wooden perch makes the perfect size step that can be firmly grasped by the chicken’s clawed feet. A wooden step is safer in freezing weather as a bird’s wet feet can’t be frozen to the treadle step in sub zero weather.